The model P pistol is the slightly larger .45 ACP variant of the A/B series of 1911-inspired pistols that led Star design for the next 60 years. The models A, B, P and M had roughly comparable upates over the years. Just like all early 20s variants, with a straight backstrap and smaller thumb safety. Only made from 1923 to 1931, when it was replaced with the second model. Changes, as with all A, B, M, P variants to make the line more like the Colt 1911A1. Namely, the arched backstrap and larger thumb safety, as well as more rugged and simple sights. Made from 1931 onward. This was one of a small number of machine pistols that Star made of existing pistol variants. Only relatively few were made, from 1931-1934. A wooden shoulder stock was also provided which slid into a notch on the back of the grip frame. The stock could also serve as a holster for the weapon. Extended capacity magazines were also made but are now very rare. See the model M for some high quality photos of the stock and extended magazines. Fire selection was provided by a sliding switch on the right side of the slide, in the middle of the cocking serrations, as seen in the photo to the right. Some models retain the low-profile tangent sights of the first model, but some are equipped with quite nice, high-definition combat sights instead. Rate of fire was very, very high, so the full-auto mode was really of minimal value, as were the long-range tangent sights. This is the only instance of which I am aware where Star reused a model designation. It should not be confused with the much more common 1975 model PD compact pistol. Made from 1957 onward, this added a magazine safety to an otherwise unchanged second model P.
Made from 1958 onward, this as usual consisted of a number of upgrades to the weapon. Mostly the swinging link was replaced with a Sig 210 (or modern Star) style closed cam path integral to the barrel. Related to this, a full-length guide rod with captive spring, and a quick takedown lever were added as well. All of these models have a magazine safety, but one different from the previous S variants, and the extractor is modified to double as a loaded-chamber indicator. Additionally, the sights are improved in shape to make them easier to see, and minor changes were made to the trigger system. With model suffix designations similar to the BKM, two years later in 1974 the model P was shortened and lightened by the addition on an alloy frame. This seems to have been merely a production prototype for the model PD, and may have only been produced for one year. I believe it had conventional sights and retained all other features of the model PS. The 1975 PD improved on the PKM by changing the rear sight to be lower profile and slightly adjustable, removing material from the slide and other small changes to aid in creating a carry gun. A super-compact .45, especially of approximately 1911 style, was revolutionary at the time, and the gun sold very well in the US until it was discontinued around 1983 (in favor of the Firestar M45). The subsequent and still increasingly popular sub-compact 1911s from all North American manufacturers is a testament to the foresight of Star. 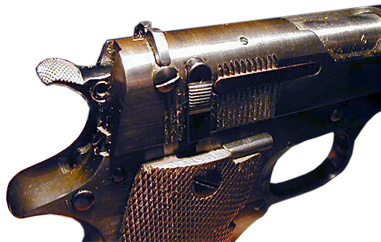 A model PD was the favorite carry piece of a number of people for years, including noted gun writers. This only increased its popularity. Very late model PDs were built with minor manufacturing shortcuts, especially in the fabrication of the slide, and will not last as long as the earlier models. Even the best of them are still alloy framed .45s, so a constant diet of full-power loads will wear them out. Firearms authorities like Jeff Cooper coined terms like "carried much and shot little" specifically for the PD, and advocated purchasing two. One for the range, and one for carry. The PD has a captive recoil spring/buffer assembly. Early ones are threaded and strongly loctited together, with a low-quality buffer. Sometime during 1981, this changed (without a model number change) to a different arrangement, including a long-life buffer with a split in the top allowing replacement without disassembly. To the left are some examples of PDs, showing as they came pretty much from the factory, the extent to which some people customized them, and a typical — but still shootable — modern example, with plenty of holster wear. On all firearms, recoil springs–and other key springs–should be changed regularly to ensure reliable functioning and prevent the slide battering the frame (hitting it too hard). On the PD this is especially critical. The PD is one of the earliest alloy frame mid or large caliber pistols, so while these rules all apply to any lightweight gun, they are more important due to the early metallurgy, and the age (and history) of most PDs you will encounter. Do not assume anything about the history of any PD (or PKM) you find today and immediately replace the recoil spring. PDs also came with a buffer, which is equally important to keep the gun running properly and not crack the frame. The original buffer used 1970s rubber technology, so will surely have fallen apart by now. I have a sneaking suspicion that many of the broken PDs are not just from metal problems, but people ignoring the buffer replacement cycle, or removing it. Modern polymers make this buffer much more reliable and effective, but it is subject to a lot of stress so replace it every few thousand rounds when you replace the recoil spring. Wolff seems to have gotten mostly out of the Star business, but Jack First, Inc. has both of these, as well as a variety of other useful replacement bits.